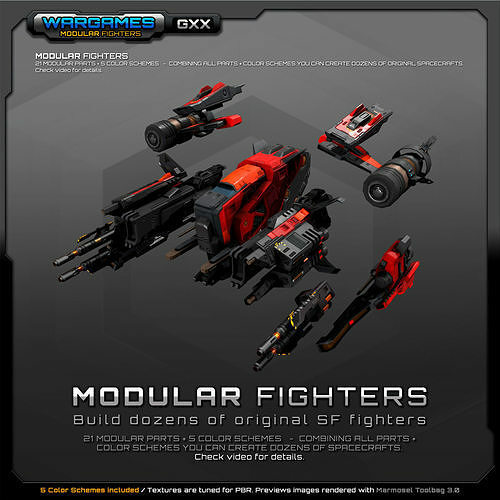 This Original package contains “Modular SF Fighters”. No animated parts, script or LOD. Included Weapons, see previews. Build dozens of SF Fighters, 21 Modular parts + 5 Color Shemes PBR ready (diffuse, normal, glow, roughness, metal, AO maps). combining all parts + color schemes you can create dozens / hundreds of original spacecrafts fighters. (All modular parts have mirrored versions to save time building the spacecrafts). Check video for details. Included spaceship parts and combination examples. View video for Polycount details. _1 Model in .3DS format. _1 Model in 3d Max format. I absolutely love this asset with parts for making different kinds of "space fighters". Good texturing, artistically pleasant shapes and forms. Looks like I will make flying AI in my current UE4 ships variations mostly by combining, editing, even "repurposing" pieces of his asset. Great stuff, if you like kitbashing, "reverse engineering" and experimenting. I recommend.